Deciding between the 2019 Honda CR-V vs. Nissan Rogue is never an easy choice. Both of these crossovers come from reputable brands and offer a wide variety of features and benefit to their respective drivers. But when it’s time to decide on the vehicle that’s going to take you throughout the streets of Cerritos, Downey, and Long Beach—which one do you choose? The most effective way to choose the right car is by comparing them to see how they differ. At Norm Reeves Honda Superstore Cerritos, we’re offering this 2019 CR-V vs. Rogue comparison to help drivers learn more about their options so they can see which one is right for them! Despite being completely different vehicles, they are each equipped with similar engines. The new CR-V includes the 2.4-liter 4-cylinder engine while the Rogue includes a 2.5-liter 4-cylinder engine. Both vehicles include a respective Continuously Variable Transmission (CVT) that provide smooth and direct acceleration while executing gear transitions more efficiently. As for the performance, the CR-V can deliver 184 horsepower and 180 lb-ft of torque, while the Nissan Rogue falls behind at 170 horsepower and 170 lb-ft of torque. Each crossover offers a spacious cabin for their respective five passengers inside, as well as some room for cargo in back. The difference in space with the front row isn’t gaping, but the rear seats, on the other hand, showcase some significant differences. The rear of the Honda CR-V offers passengers 39.2 inches of headroom and 40.4 inches of legroom while the Nissan Rogue only includes 38.5 inches of headroom and 37.9 inches of legroom for its rear passengers. Each vehicle offers some significant cargo space as well. Both vehicles include more than 39 cubic feet of cargo space behind their respective rear seats. 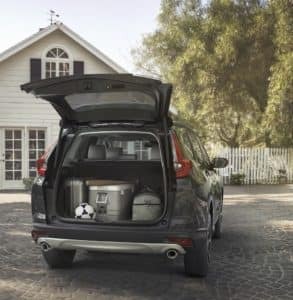 However, when the rear seats are folded flat the Honda CR-V includes 75.8 cubic feet of space while the Rogue maxes its cargo capacity at 70 cubic feet. The Rogue and CR-V each include dashboard-mounted infotainment systems in their respective cabins. These screens give drivers direct access to their assortment of media options. Each vehicle includes an AM/FM radio, USB and auxiliary inputs for portable media devices, and even Bluetooth® for both phone pairing and audio streaming. Additionally, the CR-V includes Pandora® compatibility, which allows you to access thousands of customizable internet radio stations. By now, you’re pretty well-informed about both of these popular crossovers. Of course, by reading this CR-V vs. Rogue comparison, you’re well aware of their differences too. Now that you know enough about the CR-V and its many advantages over the Rogue, you’re ready to learn even more. 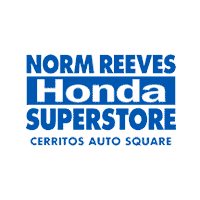 You can always visit us at Norm Reeves Honda Superstore Cerritos for a closer look, or you can climb into the cabin and experience it for yourself! We’re proud to help drivers in Cerritos, Downey, and Long Beach find the vehicle that’s right for them!